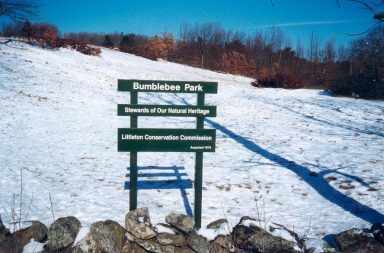 Bumblebee Park is popular for short walks, wildlife study, and sledding in winter. It features a variety of habitats in a relatively small area: hill meadow, bedrock outcrops, woodland, pond, red maple swamp, and marsh. At the gate on Harwood Avenue and across the street (as you enter Bumblebee Lane) in a marked parking area. This land was purchased by the citizens of the Town in 1973 from Malcolm and Judith Dunn. The cost was $57,500. Poison ivy. Soft muck in swamp and marsh.